It was manufactured by Max Ihle in West Germany, in 1948-52. The tape speed of the first pieces was 76,2 cm/s, later 38,1 and 19,05 cm/s. The "Ferrophon III C" was a portable, half-professional studio machine. Some pieces has used by the "Hungarian Radio" in the 1950s. 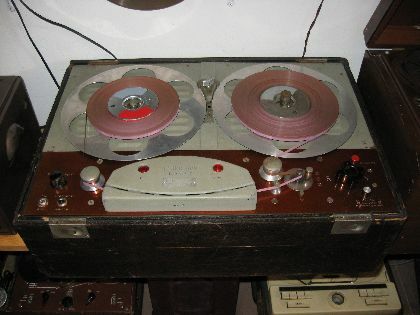 This tape recorder in the picture probably was a proto-machine, because it has a handbrake! It is well worth hearing the sound of this 60 years-old machine! It is wonderful!